Lillian Marlene Miles was born on November 25, 1945 in the New Finland District in Saskatchewan to Martin and Lily Dorma. Marlene was predeceased by her son Martin Swan, her parents Martin and Lily Dorma, her brother Edwin Dorma and her sister Irene Wilkinson. She leaves to mourn her husband Ronald Miles, his children and many grandchildren, her daughter Tanya and husband Steve Mulley, her cherished grandchildren Ashlee (John), Jaydon (Tori) and Taylor, the father of her children John Swan, her sister Beverly Casemore (John) and her brother Donald Dorma (Susan). Marlene also leaves behind numerous nieces, nephews, aunts, cousins and friends. Marlene was raised on a farm north of Wapella, Saskatchewan. She attended a country school, Convent Creek, through grades one to eight. She then graduated Grade 12 from Wapella High School. 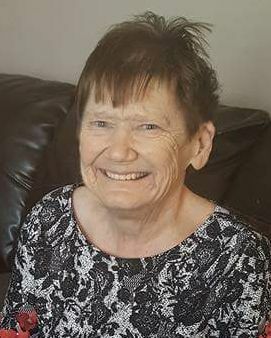 There were many times in the winter when the bus was unable to navigate through heavy snow drifts, that Marlene and her younger sister, Bev, would stay with their aunt and uncle Alex and Lavina Dorma in Wapella. It was then they experienced being a “town kid”. After graduation Marlene enrolled in a business school in Brandon, Manitoba. She later worked for Manitoba Telephones in Dauphin, Manitoba. Marlene married John Swan and they became a family of four with the arrival of Marty and Tanya. Marlene worked various jobs in the helping field all while raising a family. Marlene and John divorced and she later married Ronald Miles in Weyburn, Saskatchewan in 1988. Marlene loved to socialize and visit family and friends. Marlene amazed everyone with her ability to remember so many people’s birthdays and anniversaries. You could be certain that you would receive a call or a card from Marlene on that special day. Marlene and Ron traveled to many places and enjoyed hot holidays with her daughter Tanya and her family. Sadly, Marlene’s health deteriorated over the last couple of years. She faced each hospital stay with faith and determination. Her Finnish “Sisu” was always with her. She will be sadly missed by all her family and many friends she made over the years. Rest in Peace Marlene, love your friends and family.